The DCP Sensor adapter for LEGO. 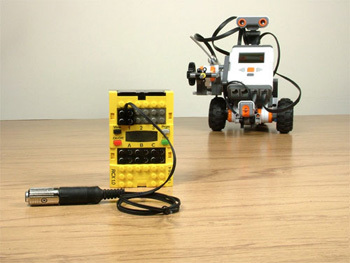 The DCP sensor adapter adapter for LEGO RCX allows standard LogIT Microsense sensors to be used with LEGO RCX and RoboLab version 2 extending sensing possibilities and allowing RCX to be used as a data logger as well as a controller. You can download a leaflet from link below. Another version of the sensor adapter will also be available for the LEGO NXT arriving very soon!! Which Microsense sensors can I use? Where can I get the sensor adapter and sensors? The sensor adapter and RoboLab 2 are exclusively available from your LEGO Dacta dealer (see www.lego.com/dacta) and the DCP Microsense sensors are available from some Dacta dealers or from DCP LogIT datalogging system distributors world-wide - see here for contact details. Please note that DCP Sensors are only supported in version 2 onwards of Robolab. The adapter is far from just a LEGO 4 stud connector wired straight into a DIN socket! Although it looks very simple, the DIN socket of the adapter actually contains many micro-components (including 2 amplifiers, a voltage regulator, 6 diodes, resistors etc!) mounted on both sides of a miniature circuit board. This micro circuitry regulates power from the RCX into a voltage suitable for the DCP Microsense sensors and also converts the output from the sensor into a signal suitable for the the RCX - all of this down just 2 wires! We made it small in order for it to fit right into the sensor socket so that the overall system remains compact and sensors can be hand held or used in a stand etc. Site Map | Terms & Conditions | Copyright DCP © 2009 Microdevelopments Ltd: All rights reserved.